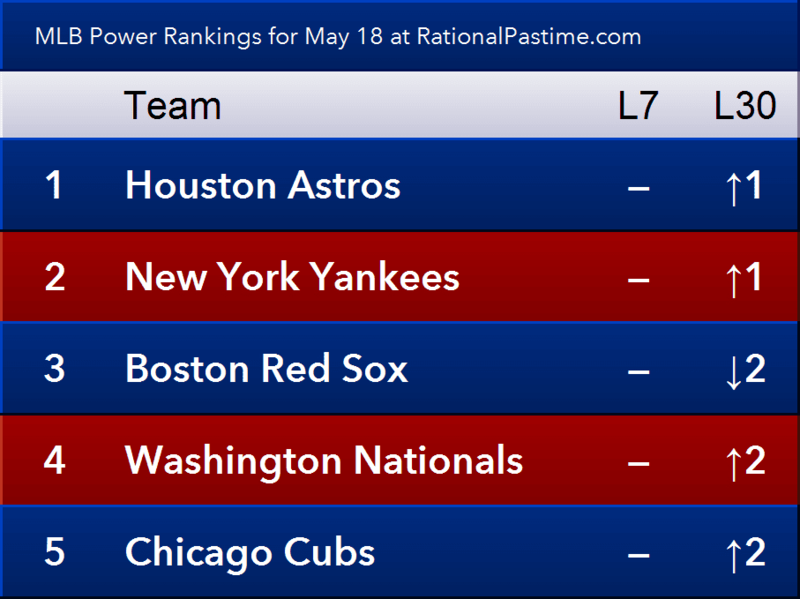 The Astros are still (probably) the best team in baseball (right now). There has been no movement at the top of the rankings over the past week, something not entirely unexpected when 40% of the Top 5 only played three games. Those two teams, the Nats and Yankees, are both expected to lead their respective leagues in wins. The Red Sox are still expected to win 100+ and need to play-in against a sub-90 wins Angels squad just to reach the first round. More projections, random observations and Good Links after the jump. The Angels became the second team to walk 12 times in one game this season on May 12 in a 7-5 win over the Minnesota Twins. The Braves' RPScore is 89 points better than their preseason rating. The Los Angeles Dodgers' RPScore is 71 points worse than their preseason rating. Those Dodgers are ranked 13th in RPScore but 23rd in actual wins. That makes them the unluckiest team that should be .500 or better. The unluckiest of all teams is the Chicago White Sox, their win rate 123 points worse than their RPScore. The Pittsburgh Pirates are the luckiest team so far with a win rate 102 points better than their RP Score. The Yankees have about a 10% chance of tying or besting the MLB regular season win record of 116 games. The Red Sox and Oakland Athletics played the closest game of the season so far on May 15, tying at 4.19 BaseRuns apiece. The home team has won 49.1% of their games this season with a run differential of -45. Aaron Judge's strike zone has gotten worse. Aaron Judge's hitting has gotten better. Travis Sawchik has the data. Twenty years ago yesterday, David "Boomer" Wells pitched a perfect game while hungover. It was the first perfect game I ever watched. Last year, Rob Neyer compiled the ultimate oral history of that game. I've been following switch-pitcher Pat Venditte since he was confusing umpires at Omaha Central High School. I was disappointed he never came up with the Yankees. He wasn't exactly dominant with the A's, but (as Ashley Varela reported last Saturday) the Dodgers are giving him another shot. So far he's allowed two runs in 2.2 innings. I'm rooting for him. In what we may someday look back upon as a landmark decision, the Supreme Court struck down the Orwellian-named "Professional and Amateur Sports Protection Act of 1992," a law that required all states that aren't Nevada to ban professional sports betting. Craig Calcaterra, Maury Brown and Sheryl Ring all discuss the implications.